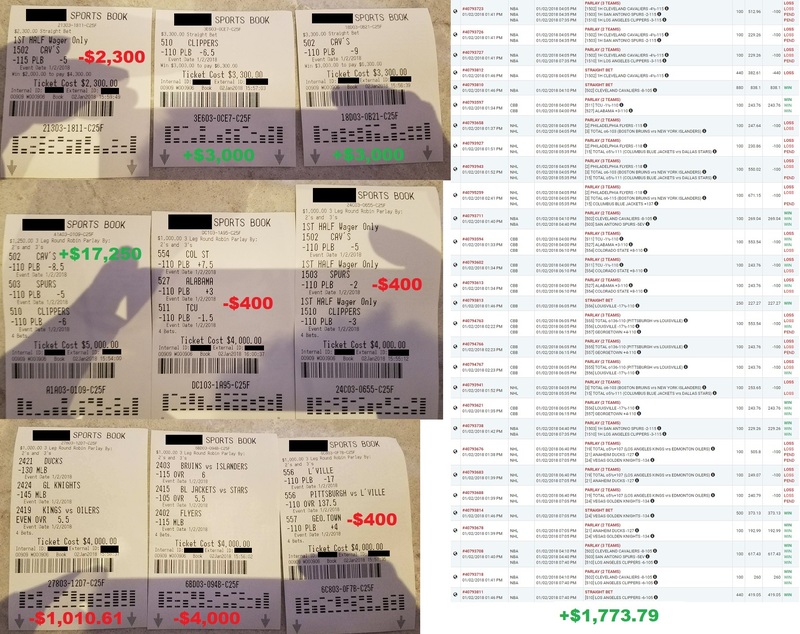 Today, I want to go over with you how I just literally won over $107,000 in the last 5 days of betting on sports. Well, my historic winning streak continues again after another massive winning day yesterday! I won 3 out of 3 on not just one, not just two, but three of them at max acceleration to skyrocket up +84.6 units in one single day yesterday! And as always, I put my money where my mouth is and wagered on the same exact picks I shared with you. In total, I wagered $59,760 yesterday on my picks and ended up cashing out $98,548.96. 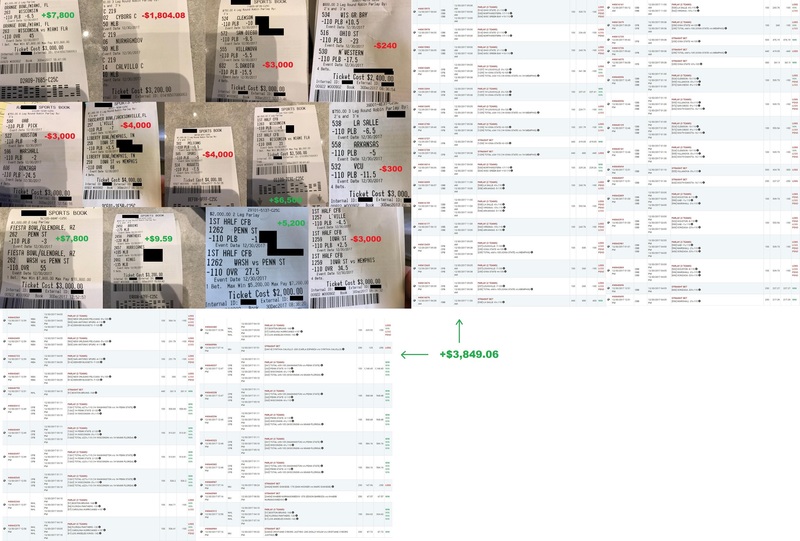 In a span of just 5 short days, I’ve now won a total of $107,464.35 in profits – all from betting on sports! Yes, that’s $107,464.35 in net winning profits. Let that sink in for a minute. 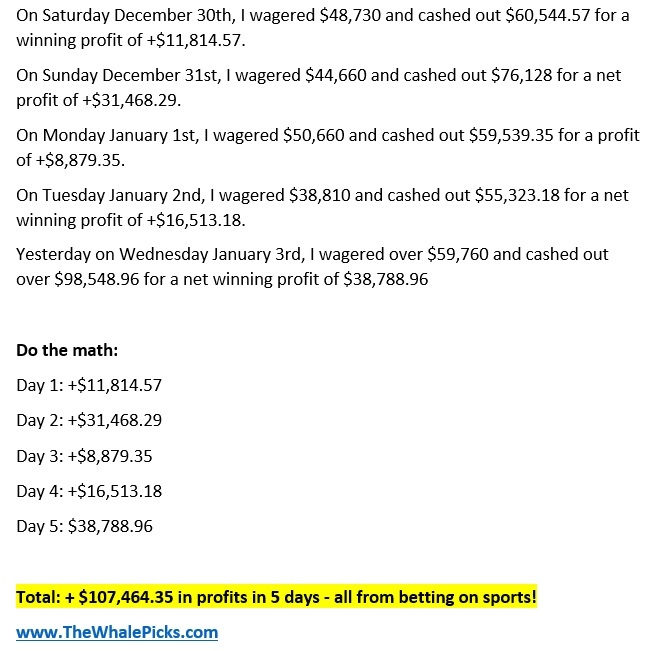 Well over $100,000 in profits in 5 days of doing nothing but betting on sports. This is not me sitting back like the other typical touts do, drawing up some theoretical charts and telling you that they can hypothetically make a fortune. This is me literally proving it to you that I’ve just actually made a fortune. And it’s all real. Unlike other typical touts who only sit back and tell you that they can win, I’m here literally going out betting hundreds of thousands to show you that I actually win. I do it because I’m a firm believer that action speaks louder than words. Just because someone tells you that they can win, doesn’t mean that you should just blindly take their words for it. I want to actually show you that I win. In the tout business, there’s a lot of wheeler dealers out there who can talk the bark off a tree. These are guys who rely on selling picks to make money. I’m not from this industry. For 30 years I made my millions not from selling my picks but from betting on my picks. And now, I’m finally sharing my picks with you because I don’t want to see you get burned by the typical touts and sports handicappers. If you’re going to follow someone and put your own hard-earned money on the line, don’t just choose to follow whoever can scream the loudest or pound on the table the hardest or flash the brightest jewelry. Choose to follow someone who has an actual established track record of winning millions of dollars. You’ve seen it for yourself now how I just won over $100,000 in the last 5 days of betting on sports. If the patterns continue to extend, you’ll see me win hundreds of thousands or even millions of dollars soon. If I could have bet at max limits like the old Mirage days, I would have already won millions. Back in the 2000’s when Pinnacle allowed me to bet at max limits, I won $4 Million dollars in 4 days. But still, $107,000 is a nice chunk of change that I’m sure would make a big financial difference in your life. So let it sink in for a bit: I didn’t just sit back and tell you how much I can theoretically win if all the stars align. I literally demonstrated it to you live as it happened so you can see it with your own eyes how I actually won well over $100,000 in the last 5 days of betting on sports. And if I’m not winning, I wouldn’t be doing this. I put hundreds of thousands of dollars to millions of dollars of my own money into play every month because I know that I’ve always ended up ahead at the end of the ride. Think about it: If I wasn’t sure that I would win, I would have to be a complete lunatic to be betting the kind of money I am every single day. So don’t be discouraged when there’s a losing day or even a handful of them. This is not a sprint. It’s a marathon. And you’ll see…when you stick with me, over the long run, I’m convinced that you’re going to make more profits from betting on sports than you ever have before and perhaps even dreamed of. 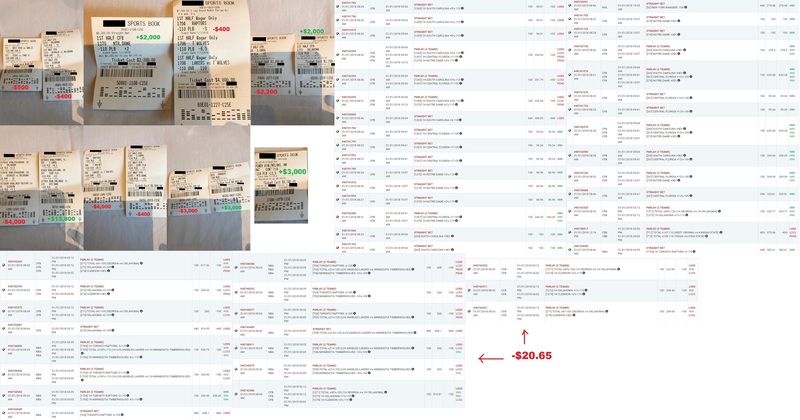 This is the same system and picks I’ve used myself for 30 years and have won some $30+ million dollars with it, making me one of the biggest and most successful sports bettors in history. I can’t wait to help you share into this piece of the pie as well. And I’m not done yet. Nowhere close. You’ve just literally seen it for yourself how I’ve just won $107,464.35 from betting on sports in the last 5 days. But for me, I’m not satisfied yet. I’m going to continue accelerating harder because I want to show you how I can win hundreds of thousands and possibly millions in one single winning streak. I can’t wait for you to see it. I’ve done it so many times in the past.